The Reverso Tribute Flying Tourbillon manages to be an interesting tourbillon wristwatch, despite tourbillon wristwatches being generally uninteresting since there are so many of them. It does that with the cal. 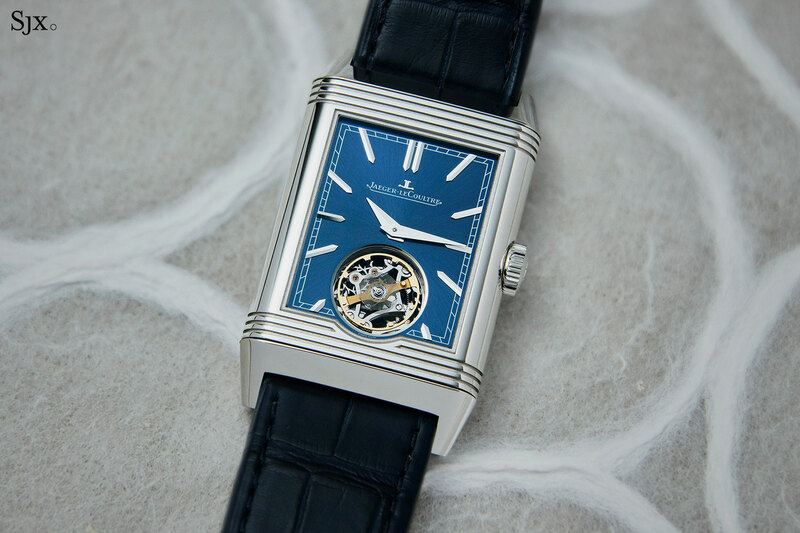 847 that combines several of Jaeger-LeCoultre’s inventive and clever innovations, most notably the Duoface twin time zone and a minimalist tourbillon. The concept is not a new one. Two years ago Jaeger-LeCoultre unveiled the Reverso Tribute Gyrotourbillon, which had two faces, two time zones, and a twin-axis tourbillon. But it was also more than twice as expensive as the Reverso Tribute Flying Tourbillon, which has a movement that is not doubt derived from its bigger brother. Despite being a fairly complex watch, the new Reverso tourbillon is compact and elegant. 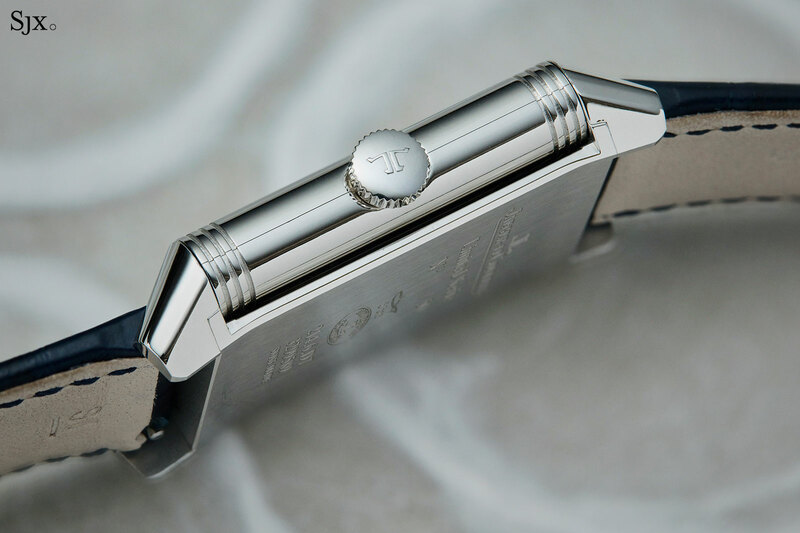 The case is 27.4mm wide and 45.5mm long, which is exactly the same as standard, time-only Reverso Classic Large. At 9.15mm high, the tourbillon is slightly thicker than the basic model, but only just, and still cuts a remarkably slim profile on the wrist. 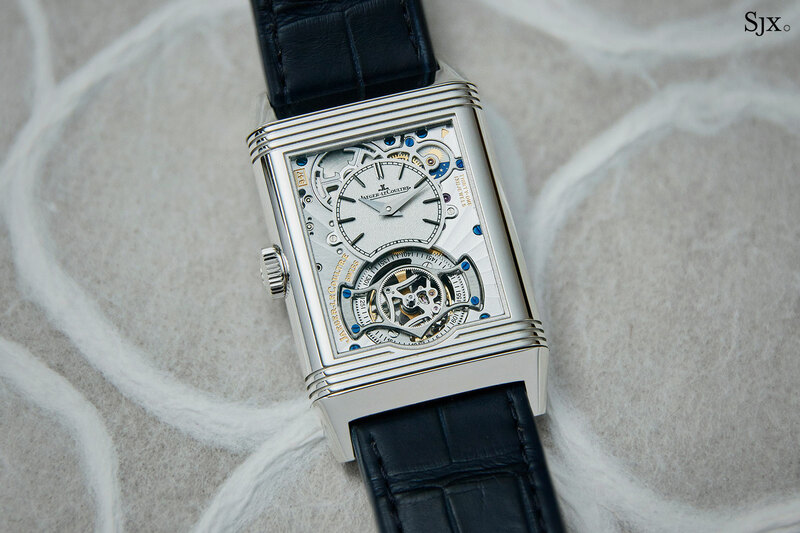 Fortunately the case is made of platinum – historically the de facto precious metal for Reverso tourbillons – giving it a good heft in the hand. 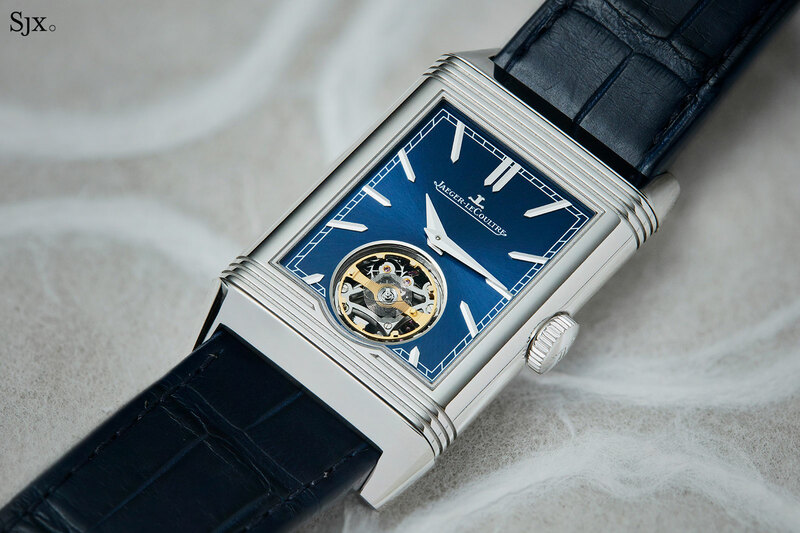 It’s the typical Reverso construction, with two main components – the swivelling case that’s attached to the lower carriage. Though well past 80 years old now, the Reverso case has remarkably longevity and still operates on exactly the same principle – push out, flip over, slide in – as when it was first invented. Intended to show local time, the front face of the watch is a deep, metallic blue with a radial brushed finish and applied baton markers. 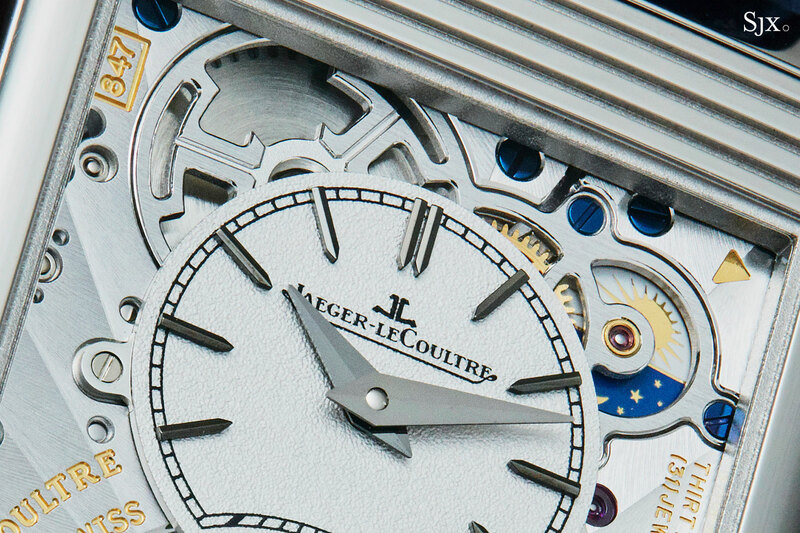 It’s a clean, uncontroversial look that reflects Jaeger-LeCoultre’s current design language. Importantly, both faces are different enough to give the watch a varied look on each side. The only important bit of the dial in front is the circular aperture at six, which reveals the unusually thin tourbillon. It’s essentially the same tourbillon construction that was premiered in 2014 inside the Master Ultra Thin Minute Repeater Flying Tourbillon, the thinnest minute repeater on the market at the time, thanks in large part to the heavily reduced tourbillon regulator. A glance at the tourbillon immediately reveals it is drastically different; in fact, it appears to be missing a few components, with the balance and hairspring being unusual naked. The tourbillon lacks an upper cage or bridge, which means both the tourbillon and balance wheel are both flying, being pivoted only on their underside. The lightness and flatness of the tourbillon – the hairspring, for example, sits in a recess in the arms of the balance wheel – means it has a low centre of gravity, which is presumably what keeps it stable despite being pivoted on only one side. The flip side of the watch has a second time display that’s independently adjustable, right down to the minute. and is intended to show home time. Again the styling reflects Jaeger-LeCoultre’s current house style, with a grained, silvery dial for the time. But the view is more interesting, because most of the movement is exposed. 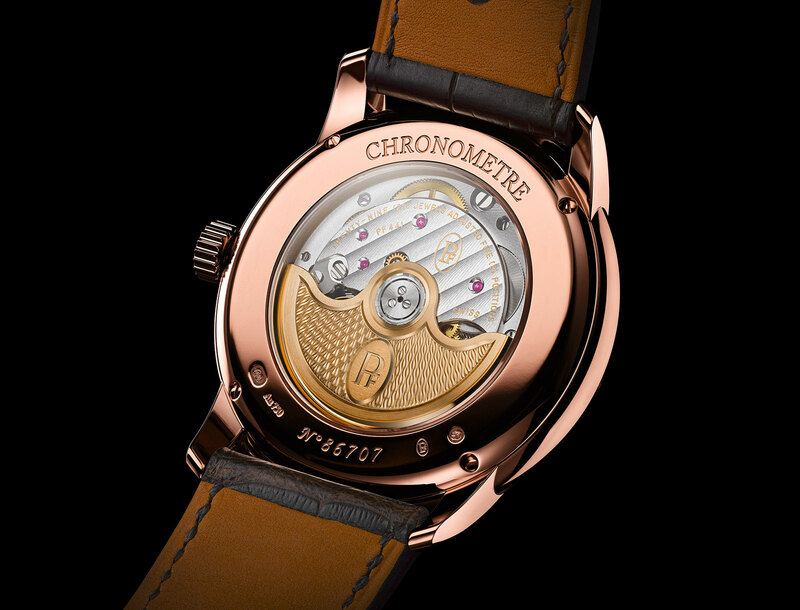 The view includes part of the barrel, which has its bridge open-worked to form the brand’s logo, as well as a day and night indicator in the top right corner of the dial. 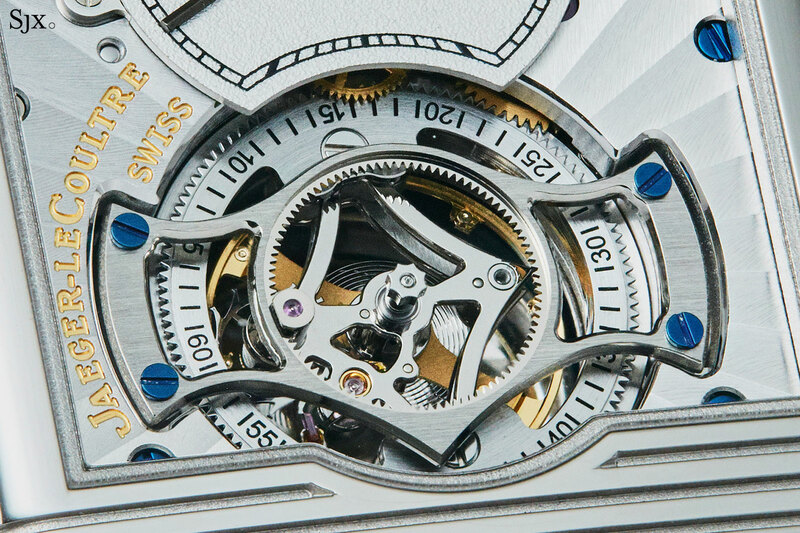 The reverse of the tourbillon is visible on the rear face, looking almost shockingly airy. 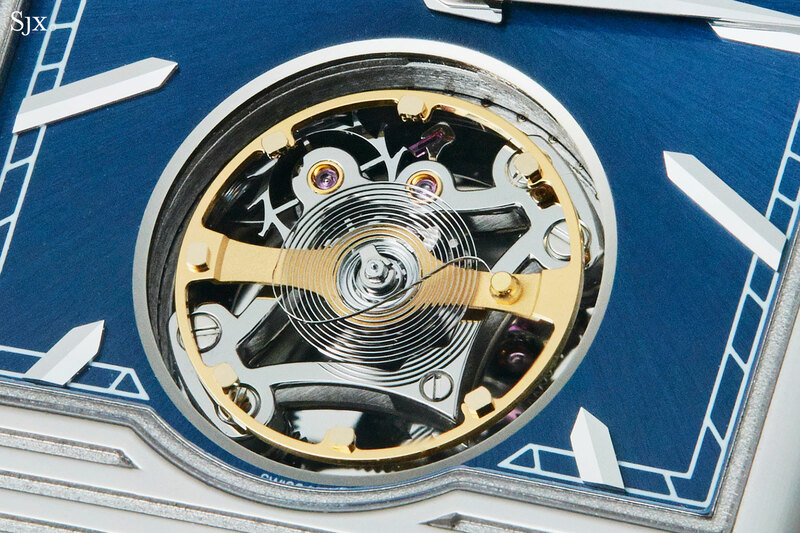 Its plate has been open-worked to reveal how minimal the tourbillon construction is. The cal. 847 inside is hand-wound and has a short, 38-hour power reserve; somewhat unsurprising since the barrel does look very small. It’s finished in fine Jaeger-LeCoultre style, with radial Cotes de Genève along with flourishes like blued steel screws and gilded engraved lettering. All of the finer details are attended to, including the polished, bevelled edges on all components. But as is typical of the brand, the finish is careful though not artisanal, not quite haute de gamme. 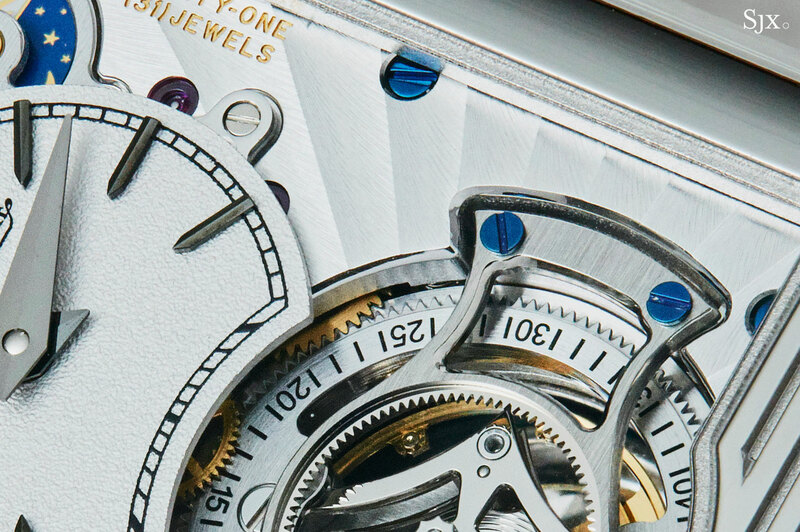 The bevels are obviously finished with mechanical tools, and not having been treated so seem as if they have not, while the screws for the lower bridge of the tourbillon are not recessed. Similarly, the polish on the tourbillon cage isn’t quite black polished. 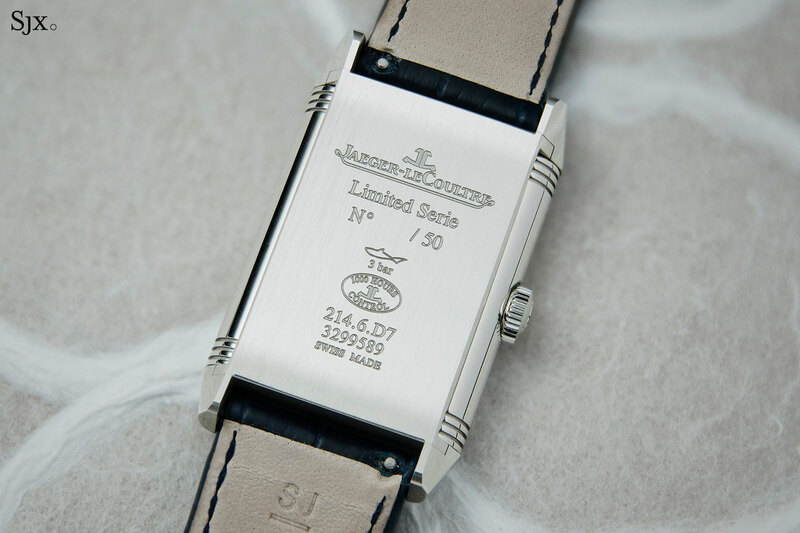 But that is besides the point because the Reverso Tribute Flying Tourbillon fits Jaeger-LeCoultre’s history well. It’s smartly engineered, practical, thin and attractively finished, all for what is a largely reasonable price as such watches go. For a spell that was lost as Jaeger-LeCoultre produced increasingly complicated watches for exponentially higher prices, and even mooted the idea of rivalling A. Lange & Söhne in movement finishing. If a criticism can be made of the watch it is the mix and match of complications, which is a favoured pastime at Richemont watch brands. The new tourbillon combines two existing mechanisms (the Duoface and ultra-thin tourbillon regulator), and is essentially a simplified version of the movement inside the Reverso Tribute Gyrotourbillon. But that is not a shortcoming in itself. Taking the classic Porsche 911 as an analogy: the Gyrotourbillon is a Turbo S, and this is a Carrera S. The new tourbillon is what it should be, and it’s good at it. 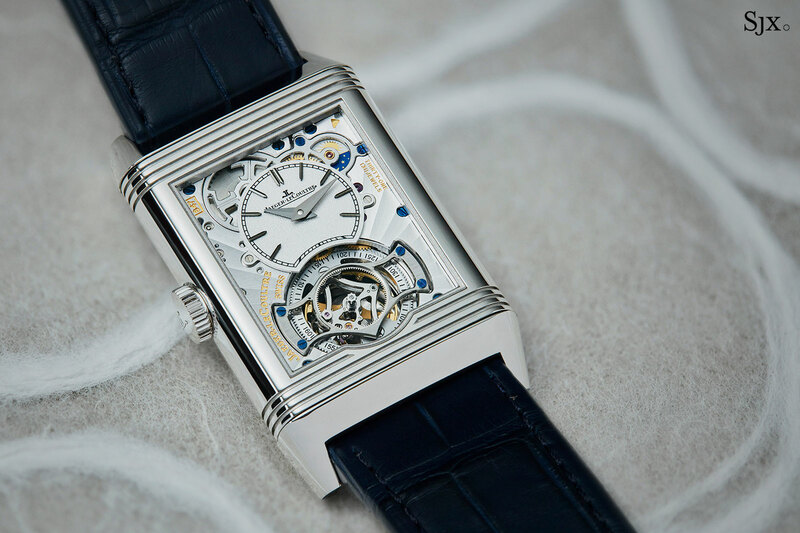 The Reverso Tribute Flying Tourbillon (ref. 3926480) is a limited edition of 50 pieces, priced at US$123,000. 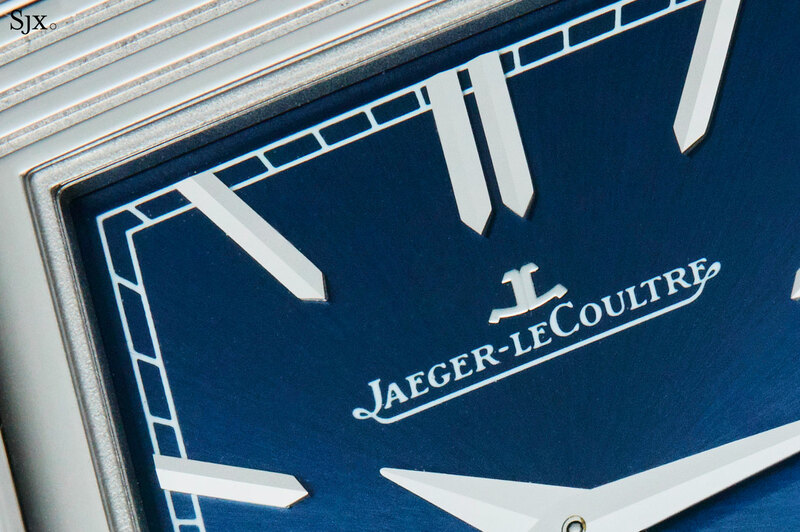 It’s already available at Jaeger-LeCoultre boutiques and retailers. We take a look at the Reverso Tribute Calendar that combines two of JLC's bestselling complications. 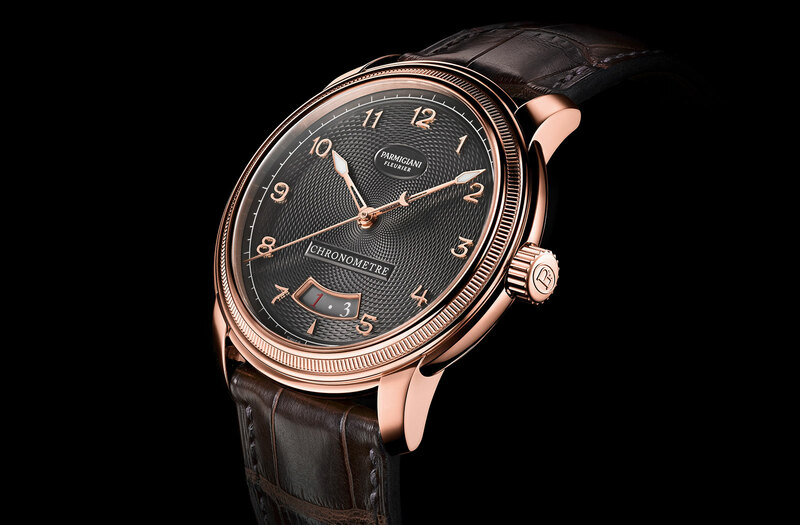 Parmigiani makes unquestionably top quality watches, though it is rarely accused of being exciting (excepting the Bugatti wristwatches). So the new Toric Chronometre Slate is expectedly classical, being a variant of a watch launched last year. 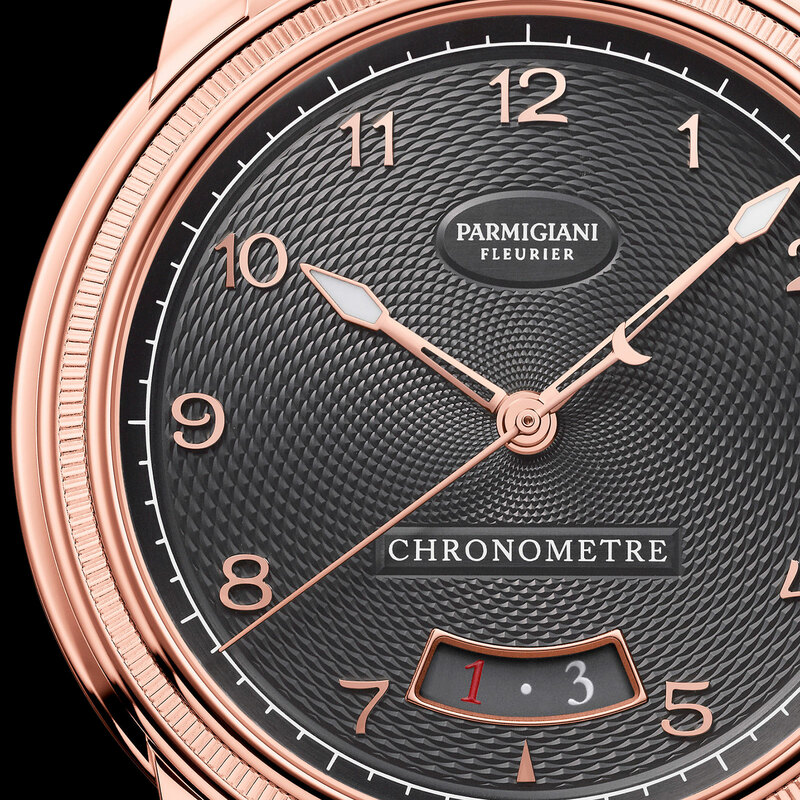 While the original had either an eggshell or black dial, the latest Toric Chronometre has a guilloche dial that, in typical Parmigiani style, was created the traditional way, engraved with a hand-operated rose engine at Parmigiani’s sister company. The dial surface has a concentric grain d’orge, or barleycorn, motif that’s been finished in dark grey. It’s matched with applied, solid gold hour numerals, as well as rose gold hands that has been newly open-worked. As on the original version, the date display sits in an elongated, fan-shaped window framed in gold. The rest of the watch is identical to the original model, with the case being an elegant 40.8mm in diameter and just 9.5mm high, again produced by another of the brand’s sister companies. It features the signature Toric bezel that’s finely knurled, once again done by hand, with the pattern created by rolling a toothed metal wheel against the bezel. Inside is the cal. PF441, an automatic movement with 55 hour power reserve. Finely finished and also COSC-certified, the movement is 25.6mm in diameter, slightly small for the case but still good to look at through the display back. The new Toric Chronometre encapsulates what distinguishes Parmigiani – eminently classical, occasionally staid design, combined with almost complete vertical integration in manufacturing, while being admirably dedicated to quality production and finishing. And that is why Parmigiani makes beautiful watches but is a loss making enterprise (and fortunately owned by The Sandoz Family Foundation, which derives most of its endowment from a Swiss pharmaceutical fortune). The price of the Toric Chronometre Slate (ref. PFC423-1600201-HA1241) has yet to be announced, but with the original model retailing for US$18,500, expect this to cost more, given the elaborate dial.